Although there were hairdressers bathing dogs in the River Seine in Paris back in the 19th century during la Belle Époque, it wasn’t until 1938 that the first salon was opened for canine hygiene and aesthetics. 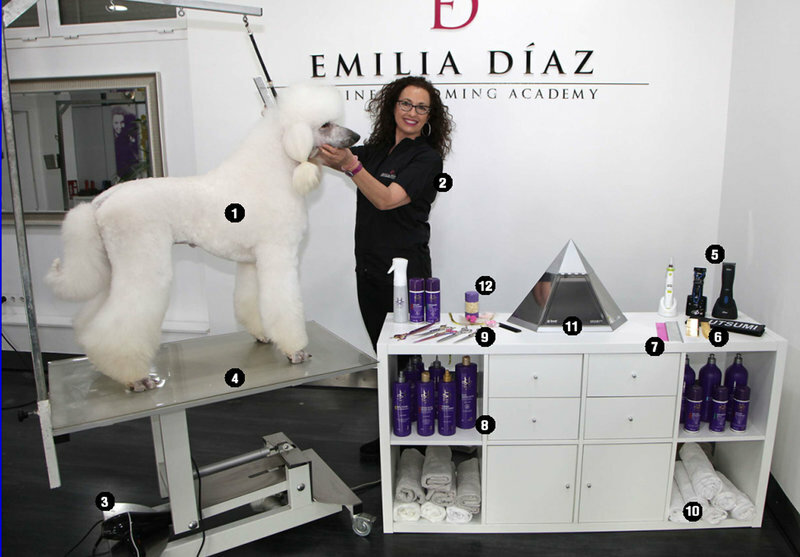 Since then, the profession of dog grooming has become more popular and nowadays there are even schools specialising in teaching these techniques, such as the Emilia Díaz Canine Grooming Academy in Girona. Emilia Díaz, who runs the centre herself, is adamant that dogs are part of the family and we must treat them just as well as we do other family members. Her philosophy has made her one of the main promoters of high-quality canine grooming in Spain. She emphasises the importance of knowing the specific needs of each individual breed and her programme, which combines theory and practice, has been applied in a number of accredited centres in Brazil, Colombia, Costa Rica and Mexico. Emilia has won numerous awards in dog grooming competitions. For example, she placed third as Spain’s representative in the 2007 World Championship, which was held in the Italian city of Verbania, and there is the gold medal she won at the Ciseaux d’Or Championship. She has also served as a judge in other prestigious competitions. 1.The dog: the centrepiece and element that gives Emilia’s business meaning. 2. Protective clothing: made from a specific texture to avoid collecting dog hair. 3. Hairdryer: a serviceable device that makes Emilia’s job easier. 4. Electric table: useful for ensuring the dog’s correct position and comfort. 5. Cordless clippers: used for cutting and grooming. 6. File: for clipping the claws, or nails. 7. Combs: the basic tool for any hairdresser. 8. Cosmetic containers: there are essential cosmetics for keeping the dog’s skin in good condition. 9. Scissors and clippers: with different sizes depending on their use. 10. Towels: also very important. 11. Steriliser: used to disinfect and sterilise the instruments . 12. Small hair bands: for pigtails and bows, of course!